CALGARY – The future of the Trans Mountain pipeline expansion was cast in doubt on Sunday as Kinder Morgan Canada suspended all non-essential activities and related spending on the project in the face of mounting opposition from British Columbia. With the company citing its decision largely on the B.C. government’s legal challenges to the pipeline and the need to protect its shareholders, the federal and Alberta governments pushed Premier John Horgan to abandon his promise to do whatever his government can to stop the project. In Edmonton, Premier Rachel Notley said Alberta would consider taking on an equity stake in the pipeline if Kinder Morgan investors are considering backing away. “If we have to, Alberta is prepared to do whatever it takes to get this pipeline built,” said Notley, without discussing the dollar value of such an investment. Kinder Morgan’s move will be seen as a blow to Prime Minister Justin Trudeau, who has insisted the pipeline will be built. The expansion, which would triple the amount of oil flowing from Alberta to Burnaby, B.C., was approved by the federal government in 2016. The company said it will consult with “various stakeholders” to try and reach an agreement by May 31 that might allow the project to proceed, adding it needs “clarity” on its ability to do construction in B.C. and protect its shareholders. “As KML has repeatedly stated, we will be judicious in our use of shareholder funds. In keeping with that commitment, we have determined that in the current environment, we will not put KML shareholders at risk on the remaining project spend,” Steve Kean, the company’s chairman and CEO, said in a statement. Kinder Morgan has spent about $1.1 billion on the $7.4-billion project so far. Horgan said he spoke with Kinder Morgan president Ian Anderson, who told him the project has been “unnecessarily harassed” by British Columbia. “I told him I disagreed,” Horgan said. The B.C. premier said he also spoke to Trudeau and planned to speak to Notley, but his position on the pipeline hasn’t changed. Horgan is pursuing a reference case in the courts to determine if his government can control the shipment of oil through the province on environmental grounds, which Kinder Morgan mentioned as a factor in its decision. “Rather than achieving greater clarity, the project is now facing unquantifiable risk,” the company said in its statement. There is also another legal challenge in the Federal Court of Appeal, where the federal government’s approval and B.C.’s environmental assessment certificate for the project are being challenged. A federal government official speaking on background told The Canadian Press the timing of the announcement has more to do with construction schedules than a specific event in recent days. 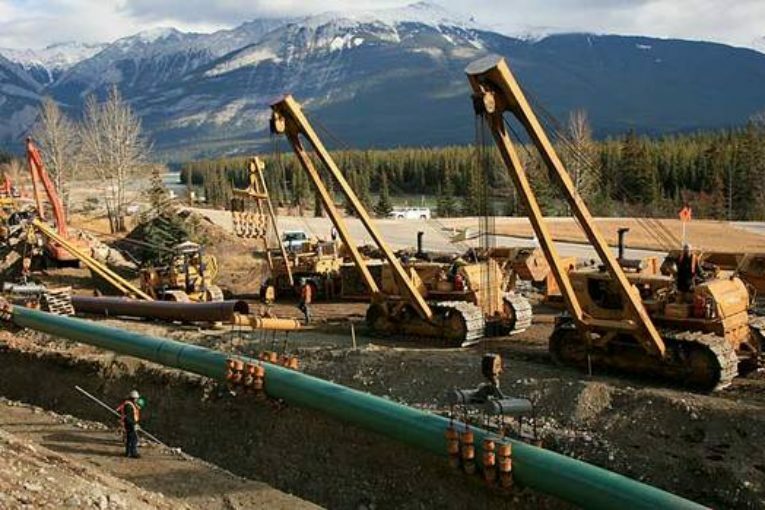 Kinder Morgan has to get construction of the pipeline underway by the end of May or it will likely lose out on another construction season, which adds significant costs and threatens to further fray investor nerves. Carr said the government was given a heads up Saturday afternoon that the decision was coming, which prompted him to return to Ottawa from New York. He said it wasn’t expected, but his office was aware the delays and uncertainty posed by British Columbia’s threats were having an impact. “We knew that their investors were getting nervous,” said Carr in an interview. He criticized British Columbia, saying the province’s “threat of prolonged court action has consequences” not just for Canada but for B.C. as well. He noted the B.C. economy is heavily dependent on natural resources — be it oil, natural gas, wood products or mining — and scaring off Kinder Morgan investors could have long-term consequences on British Columbia’s ability to attract investment elsewhere. The project has become a major irritant in the relationship between Alberta and B.C., with Alberta going as far as banning the import of wines from its neighbour for a period of time. On Sunday, Notley also described the B.C. government’s position as short-sighted. Notley called on Trudeau to take more “concrete action” to get the pipeline built, adding that legislation is coming in the next few days to give her the power to turn down the taps on oil headed to B.C. Other retaliatory actions, such as a renewed ban on B.C. wine, are also being contemplated, she said. Horgan played down suggestions B.C. is scaring off potential investors for future projects. Trudeau has argued it is possible to balance the interests of both the economy and the environment in pushing for the pipeline’s expansion. The prime minister made that argument on Friday when he visited Fort McMurray, Alta. Still, protesters have said the expansion would increase the risk of oil spills in the Burrard Inlet, and that completing it would mean the federal government will not be able to meet its commitments to cut greenhouse gas emissions by another 200 million tonnes per year by 2030. Opposition to the pipeline has ramped up in recent weeks, with about 200 people arrested near the Burnaby marine terminal in the last month. Groups opposed to the project said Sunday’s announcement should be the beginning of the end of the pipeline expansion. “Clearly, investors have lost confidence in this project and are waking up to the reality that the Kinder Morgan pipeline will never be built,” said Sven Biggs, energy and climate campaigner for Stand.earth.